Every time I fly back home to Los Angeles, I head straight from LAX to Benito's on Santa Monica Boulevard. Any other Washingtonians with So-Cal ties can probably vouch for me when I say wannabe Mexican takeout spots like Chipotle and Baja Fresh don't come close to the hole-in-the-wall taco shops on every corner in central L.A.
Until last week, I'd assumed they just didn't exist on the East Coast. Then, as I was jogging back from Meridian Hill Park, there she was: Pica Taco, as if the carne asada gods had heard my prayers and answered them at 1406 Florida Ave. N.W. I knew this place meant business when I scanned the menu. The tacos are made with corn tortillas, not flour. They offered everything from tacos to burritos to enchiladas and tortas. And just as a little test to determine if Pica was the real deal, I ordered what I would normally get back home, without giving the woman at the counter any specifics. Within minutes I was sitting in front of two piping-hot barbacoa tacos and two more carne asada. Just as they should have been, the warm corn tortilla shells lay flat, topped with a generous helping of steak and shredded beef. Each was covered in fresh cheese, pica de gallo, lettuce, cilantro, lime, chopped onions and tomatoes. I added a couple of slices of avocado and salsa verde then folded one up, careful not to drop any of the toppings. My tastebuds fell in love, and I usually don't move that fast. Pica's owner, Maria Villabla, even came over to our table with her very own secret salsa for us to sample. I didn't need to test it out on the corner of my plate -- after tasting those tacos, I trusted this woman with my life. So I squeezed a nice little helping all over the basket of tortilla chips and washed everything down with a Corona. Within twenty minutes, my plate was totally naked, and my stomach full. I'm not the only one to know the magic of Pica. Immediately after picking up his friend from the airport, Craig Vandevusse, a frequent Pica diner from U Street, chose to take his pal to the little Columbia Heights hideout because it's one of his favorite places to eat in the District. "I love the home environment that's in here," said Vandevusse. "Usually when I come I get three tacos: pollo, barbarcoa and pastor. Those will satisfy any mood that you're in; they are absolutely delicious." Whether you're a carnivore, pescatarian or vegan, Pica has you covered. In addition to the classics like chicken, steak and pork, they offer fish, chorizo sausage and lengua (beef tongue), and vegetarian items like the popular spinach enchiladas and quesadillas. For those brave souls with big appetites, the El Toro Burrito Challege is calling. 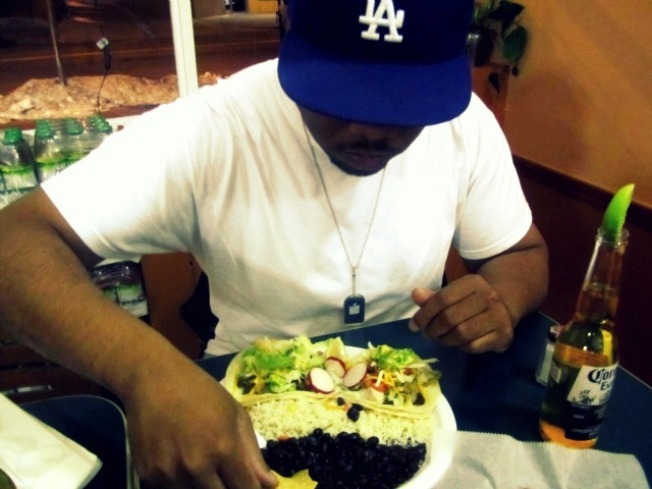 The Challege: eat a massive four-pound burrito in 45 minutes or less. The reward: Besides basking in eternal glory, your burrito will be on the house. You'll also receive the El Toro Burrito Champion T-shirt, a gift certificate and your photo on the wall of fame.